Maneesha, beyond enlightenment is only beyondness. Enlightenment is the last host. Beyond it, all boundaries disappear, all experiences disappear. Experience comes to its utmost in enlightenment; it is the very peak of all that is beautiful, of all that is immortal, of all that is blissful — but it is an experience. 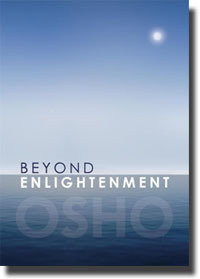 Beyond enlightenment there is no experience at all, because the experiencer has disappeared. Enlightenment is not only the peak of experience; it is also the finest definition of your being. Beyond it, there is only nothingness; you will not come again to a point which has to be transcended. Experience, the experiencer, enlightenment — all have been left behind. You are part of the tremendous nothingness that is infinite. This is the nothingness out of which the whole existence comes, the womb; and this is the nothingness in which all the existence disappears. Science has something parallel; there is bound to be something parallel. The spiritual experience is of the interior world, and science is the exploration of the exterior. But both are wings of the same existence — the inwardness and the outwardness — they always have similar points. Scientists have come to a strange conclusion in this century, that a few stars suddenly disappear… and stars are not small things; they are not so small as they look to you. They look small because they are so far away, millions of light years away, but they are huge. Our sun is a star, but of a mediocre size, medium size. In comparison to the earth it is vast, but in comparison to other stars it is a small, medium-sized star. There are stars which are a thousand times bigger than the sun. And in this century, for the first time we had the instruments of observation and we were very much puzzled: suddenly a star disappears, not even leaving a trace behind of where it has gone. Such a huge phenomenon, and not even footprints — in what direction has it gone? It has just moved simply into nothingness. This was happening continually. It took almost twenty years to figure out this new phenomenon: that in existence there are black holes. You cannot see them, but they have tremendous gravitation. Even the biggest star, if it comes within their radius of magnetism, will be pulled in. And once it is pulled into a black hole, it disappears. It is the ultimate death. We can only see the effect; we cannot see the black hole, we only see that one star is disappearing. After the black hole was almost an established theory, scientists started thinking that there must be something like a white hole — there has to be. If it is possible that in a certain gravitation, magnetic force, a big star simply disappears out of existence…. We have been aware that every day stars are born. From where are they coming? – Nobody has asked it before. In fact, birth we always take for granted; nobody asks from where the babies are coming. Death we never accept, because we are so much afraid of it. There is not a single philosophy in the whole history of man which thinks about where the babies come from, but there are philosophies and philosophies thinking about what is dead, where people go on disappearing to, what happens after death. In my whole life I have come across millions of people, and not a single person has asked what happens before birth — and thousands have asked what happens after death. I have always been thinking, why is birth taken without any question? Why is death not taken in the same way? We were aware for centuries, almost three centuries, that stars are being born every day—big stars, huge stars — and nobody raised the question, “From where are these stars coming?” But when we came to know about the black holes and we saw the stars disappearing, then the second question became almost an absolute necessity. If black holes can take stars into nothingness, then there must be something like white holes where things… stars come out of nothingness. I am reminded…. Mulla Nasruddin had applied for a post on a ship. He was interviewed. If there are holes in existence where things simply disappear into non-existence, then there must be holes from where things appear from nothingness — and just a little imagination is needed. Scientists have not worked on it yet. My suggestion is that a black hole is like a door: from one side it is a black door, a black hole—things go into it and disappear into nothingness. And from the other side of the tunnel—it is the same door, just from the other side — it is a white hole; things are born again, renewed. It is the same womb. Beyond enlightenment you enter into nothingness. Just pure nothingness remains, utter silence. Perhaps this is the destiny of every human being, sooner or later to be achieved. We don’t know yet whether there is a white hole or not—there must be. Just as you enter beyond enlightenment into nothingness, there must be a possibility of coming out of nothingness back into form, back into existence—renewed, refreshed, luminous—on a totally different plane. Because nothing is destroyed, things can only go into a dormant state; things can go only into deep sleep. Then in the morning they wake up again. This is how the existence goes on. In the West, this idea has never happened in the two thousand years’ history of philosophy. They only think of this creation: “Who created this?” and they get into troubles because whatever the answer is, it is going to create more questions. In the East we have a conception of circles of existence and non-existence, just like day and night. Creation is followed by de-creation, everything goes into nothingness, just as day is followed by night and everything goes into darkness. And the period is going to be the same: as long as the creation is, so is the resting period going to be; and again there will be a creation of a higher order. And this will go on from eternity to eternity — creation, de-creation, creation, again de-creation—but each time the morning is more beautiful. Each dawn is more colorful, more alive; the birds are singing better, the flowers are bigger, with more fragrance. And the East has a tremendous courage of accepting the idea that this will go on forever and forever. There has never been any beginning, and there will be no end. After enlightenment, you have to disappear. The world is left behind, the body is left behind, the mind is left behind; just your consciousness, as individuality, is still there. To go beyond enlightenment is to go beyond individuality and to become universal. This way, each individual will go on moving into nothingness. And one day, the whole existence moves into nothingness and a great peace, a great night, a deep, dark womb, a great awaiting for the dawn…. And it has been happening always, and each time you are always born on a higher level of consciousness. Enlightenment is the goal of human beings. But those who are enlightened cannot remain static; they will have to move, they will have to change. And now they have only one thing to lose—themselves. They have enjoyed everything. They have enjoyed the purity of individuality; now they have to enjoy the disappearing of individuality. They have seen the beauty of individuality; now they have to see the disappearance and its beauty, and the silence that follows, that abysmal serenity that follows.